So a trip up to Scotland has meant that blogging has been a little non existent! But I am glad to report that this hasn’t meant that I haven’t run! So far so good! After saying in previous posts that I was unsure which plan to follow, I have ended up ditching both the plans I was originally thinking about, and going with a improvers plan from Women’s Running Magazine. It involves running four times a week, but you can decide which days to complete the runs on. The distances and type of training sessions just felt ‘right’, whatever that means for someone who has never run a marathon before!! So I am now one long run off completing week 2 of training, and I am actually really enjoying it. Next week is going to be the big test as I am back at work and have to fit the training around work! 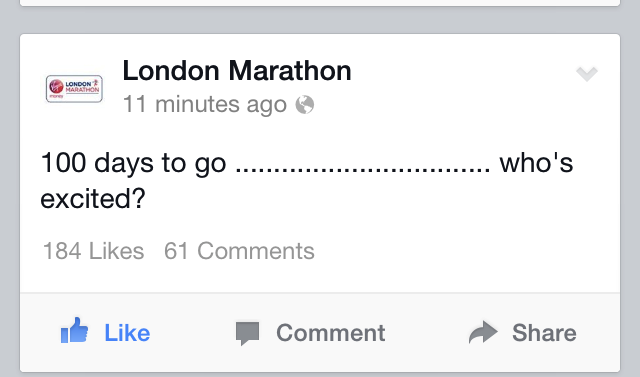 To be honest I find working tiring, let alone the added training for a marathon, so its going to be interesting! So training so far this week has consisted of Sunday – LR (Long Run) 60 minutes, a 15 minute RR (Recovery Run) on Monday, which I did on the Treadmill. Tuesday – TR (Tempo Run) 10 Minutes warm up, 15 minutes Tempo and 10 minutes cool down. Today I completed an interval training session. Well, maybe completed is a little bit of an exaggeration! These are not my favourite sessions, and I am not all that good at them. My plan said 10 minutes Warm Up, then 2 minutes hard running, followed by 3 minutes easy x 4. Changing pace, and working at some intensity is fairly new for me and I struggle. After playing basketball for so many years, I am used to going flat out down the length of the court and thats it. Trying to run with any intensity for 2 minutes means I often fail. I start of too fast and then blow out! Today I last about 1 and 1/2 minutes before I couldn’t carry on! I tried to adjust my speed for the other reps, but I have a long way to go, before I will really be able to feel my pace! All this attempting speed means that I am actually looking forward to my LR this weekend. I have to complete 75 minutes, and I am going to have company too, so I am hoping for a nice easy pace with lots of chatting. Scary, but at the same time, I’m hoping my training continues the same as these first 2 weeks, enjoyable and achievable!